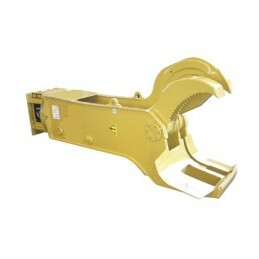 The Yellow Line wood splitter clamp is an equipment designed for the size reduction on the ground of large logs, tree stumps of wood already cut in order to rationalize their transport, the subsequent processing steps (chipping, shredding) and to speed up the natural internal drying effect. The profile of the claws is designed to reduce the effort of penetration of the blades in the trunk, operation further facilitated by the presence of rolls. It’s equipped with an hydraulic rotation to increase the precision and limit the need for additional excavator movement. The range consists of two models for 14 - 30 tonne excavators (31 000 - 67 000 lb).